With the weather to be sunny and in the upper 60's we decided to drive the jeep up Highway 1 along the coast just to see what photo opportunities we might come upon. Highway 1 is a winding, twisting, beautiful stretch of highway that runs right along the coast from southern California all the way up to San Francisco. Just after passing the little town of San Simeon we saw a turnout off to the side of the road that seemed to be attracting a lot of people. So we decided we would see what the attraction was for ourselves. We pulled in , parked the car and discovered an awesome sight. 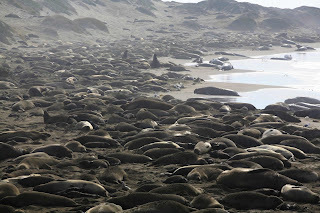 The beach area was literally covered with elephant seals basking in the sun. Apparently, the females come ashore around the first part of February and give birth on the beach. The pups were small so we figured they had only been born about a week before. The males(bulls) were there as well but stayed closer to the waters edge protecting their little harem of females and keeping other bulls from getting too close. We throughly enjoyed what we were seeing and could have watched and listened to their interaction for hours. But, we needed to move on. North of San Simeon, Highway 1 is literally built into the side of the Santa Lucia mountain range. At times only a guardrail is separating the road from a drop of a few hundred feet into the ocean. We love this highway and it's awesome views but it was now 12:30 , and we were getting hungry. We had decided earlier that we would skip lunch and have afternoon tea at the Tea Cozy in Cambria. So we decided that we should turn around and head back and about an hour later we arrived back in this cute coastal town about 20 miles north of Morro Bay. The Tea Cozy ( http://www.teacozy.com/ ) is a small (very small...about 8 tables) english tea house and restaurant housed in an old house that was built in the 1890's. All the tables were full when we arrived We were told it would be about a 15-20 minute wait so we did some window shopping at some other shops down the street while we waited for a table to open up. In the past, we have thoroughly enjoyed the British tradition of afternoon tea, both in London and at the Grand Floridian resort at Disney World so we get excited whenever we have a chance to have it. John and I each ordered the Dutchess tea selection of a cheddar and chutney tea sandwich and a scone with clotted cream and jam to go along with our pot of tea. Now, this wasn't a lot of food and while we both would admit that most of the fun is in the experience, we were still hungry when we left the restaurant! We went back home and declared it to be peanut time! Oh and by the way Harmony really is a town, population 18. We've had a really good time in Morro Bay and Paso Robles area but it's time to move on. Tomorrow it's on to Santa Cruz. mom, i really love your descriptive stories about the adventures you and dad are having...you both seem like you are really enjoying yourselves and your well-earned vacation.